is the largest and fastest growing Western market for quality, loose leaf and specialty tea? is the global leader in terms of a core target audience of tea lovers with substantial purchasing power? You might have known or you might have not. If not, just have a look at the stats! But really, given the speed at which Germany’s loose leaf, quality and specialty tea market currently develops, all stats and numbers available – though talking volumes anyways – will already be history and surpassed by reality already at the very moment you will find them published. It is true! I have been working with my venture SiamTeas on the German market for more than 3 years now, and I am looking at a flood of new members in German tea forums, new online tea shops, new brick-and-mortar tea specialty stores and other tea-related projects mushrooming and appearing anew on a daily basis. 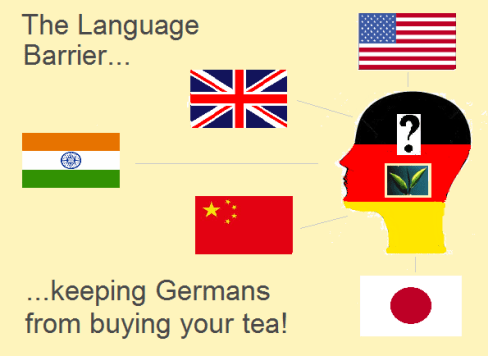 German tea consumers, which are the world’s best-informed and most information-hungry tea consumers at the same time, rely solely on information materials and sales offers in their own native language: German. This, you might have not known, as the Germans YOU are talking to and communicating with are all more or less fluent in English language – naturally, as otherwise you wouldn’t be able to talk to or communicate with them. But what about the estimated 75% of Germans who have no or only insufficient English language skills? Wouldn’t you like to talk, and eventually sell, to those, too? And wouldn’t that be a real gain for both sides, a “win-win” situation, so to speak? I observe that German tea lovers and buyers are left standing in the rain, when it comes to the availability of genuine suppliers of tea and tea-related services in their native language. As a result, doors are wide open for another stage of intermediaries on the market bridging the language gap, which in fact in a globalized economy is the only gap still existing between international tea suppliers and German tea buyers. Such intermediaries mostly are Germany-based wholesalers and/or brokers that have focused on being the missing link between the international retail/wholesale tea and tea-related services supply market and the German tea consumers/retailers, who are not savvy enough in English language to draw information and perform their purchasing from sources that are only available in English language. It great they are there, but inevitably they add both to the cost of the tea and the complexity of your business. And let alone those buyers who are positioned somewhere in the grey area made up by German tea buyers who have some basic school-level knowledge in English language, but are by no means skilled enough to satisfy their information needs, handle their purchasing activities, or even participate in negotiation efforts of any kind in English language. In my own tea venture SiamTeas, which duplicates all of its activities in both German and English language, the German language branch makes up as much as 80%, in words: eighty (!) percent of our tea and tea accessories sales. This means, the great and population-strong United States of America, plus the whole of the remainder English-speaking world only makes a fracture of our tea leads and sales compared to those based on German language presentations and publications. And I know of many online tea retailers, who are happy to serve the German market only. Another very strong argument for a German online presence is the great influence of Google and other search engines on actual online shopping behaviour. On the one hand, German buyers, again: both on consumer and retailer level, relying on German language and “googling” their keywords in German only, cannot even find the wealth of offers you can find via Google, and even if they could, would or actually do conduct their search using English language keywords, the returned results will not reveal their contents and value to them. Suppliers, on the other hand, are only found in Google searches that contains their keaword in the language their web presence is written in. Now, wouldn’t it be desirable to be found by potential German buyers, too? Do you think that any translator and/or translation/localization provider can do this trick for you and create a German language presence for you? Of course, they can, to a certain degree. But as a tea professional yourself, you know that “tea language” is not like any other language. You are aware that the realm of tea has its special set of terms, names, attributes, verbs, expressions and style, and based on my experience in both linguist services and the tea industry I can tell that whatever translation and/or localization services a non-tea-savvy linguist will provide will never be more than a sub-optimal solution. They won’t be able to properly identify your core materials, and they won’t be able to size, customize and plan your translation/localization project according to the actual individual needs of your tea/tea-related business either. Moreover, they won’t be able to meet the doubtlessly very special language requirements of the tea branch, and thus they ultimately won’t be able to convince your potential customer of buying your products. With my background of more than 7 years of experience in the translation and localization business and my specialized skill in translating tea-related information and marketing materials between English and German languages, I have now decided to bring my two main areas of expertise together and combine them to just one powerful tool, offering you the option to directly benefit of the great potential of the German tea market by translating and localizing your core online presentation materials and publications to German language and/or the German market. Believe me, the cost are actually ridiculous compared to the new potential you are opening up this way for your tea, tea accessories or otherwise tea-related businessy! Together, we can take on the task of identifying a core portion of your materials and publications and develop a plan on how to translate and localize them for the German market. And then we just make it happen! As for the technical implementation of online materials, I will work closely with your existing webmaster to implement your German translation and German market localization at no or low additional technical implementation costs, depending on your current setup of web presence maintenance. just to name a few obvious and very common areas of application. Turning to me and talking about it won’t cost you a single buck in the first place, while I am convinced that I will be able to show you how you can bring all of your offers and services to the German market of well-funded tea lovers and/or tea retailers and thereby eventually multiply your sales numbers. So, don’t hesitate and contact me by email, phone, Skype, Facebook and/or any other common means of communication to discuss a fully customized solution for the German market approach of your tea or tea-related business! 7 years of professional experience in German/English translation and localization business!